As it sometimes happens, the children became wild as March hares after being fed. The adults usually just want to just talk or take a nap after a meal. I was about 2 years old at the time and had been watching older kids climb upon an arched window opening of the shelter, then jumping the short distance to the grass below. Before long I decided to give it a try. With my short, baby fat legs, I climbed upon the ledge of the opening. All was going well until a strong northerly gust blew me right back down on the cement floor, breaking my arm in the fall. Cindy Martin, not yet 2. I learned to respect our Kansas wind. Most of the time I count it as a friend, but I’ll always remember when we tangled some 37 years ago. I’ve heard many pioneer women were said to have nearly gone crazy by the relentless wind…. but I find the wind rather soothing at times. I especially enjoy the changing seasons we have here in Kansas with the wind almost constant in early spring and fall. The wind produced by a tornado is something totally different. As you probably know tornados come in all sizes, from a twisting rope to filling the whole skyline with its mass. The tornado that hit Andover Kansas was definitely a monster I hope never to hear or see the likes again in my lifetime. The guest blogger today is Gail and Clyde Martin’s daughter, Cynthia Ross. This article first appeared on eHow in 2010. This may sound old-fashioned, but making and playing with a stick horse can provide hours of fun for a young child. It’s a simple project, so involve the child in making the horse. Then send them out in the yard to gallop around with the stick horse. They’ll get lots of exercise and fresh air. As you can see in the photo on my book cover, my first stick horse was a 2 X 4 piece of wood with a rope reins. I’ve made several of the sock stick horses for my own children. Choose a stick. A suitable stick horse can be a cut-down broomstick or another piece of wood. It needs to be long enough for the child to straddle it with one end on the ground and the other end about chest-high. Find an orphan sock and some string, rope or yarn. The sock could be white, black, gray, tan, or brown depending on the look you want for the horse. Rags make an adequate stuffing for the horse’s head or use some old pillow stuffing. Fill the sock with whatever you have on hand. Place the sock over the end of the stick. Wiggle the stick up into the stuffing. Add more stuffing if needed. Use the string, lightweight rope, or yarn to tightly tie the sock’s ankle part to the stick. Even a long shoestring would work. Help the child with this part, as it is hard for them to tie the rope tightly enough that the head won’t fall off. Tie the rope or string around the horse’s nose (the toe of the sock) and make reins for the rider of the stick horse. You can make a full bridle for the sock horse head if you want. Decorate the sock horse head any way you want. Glue or sew on buttons for eyes or just add them with a felt-tipped marker. If you want to get more elaborate, give the horse a mane. You can put a line of glue down the neck of the horse and stick pieces of yarn to it. An alternate way is to cut a fringe in a square of fabric, then glue the uncut side to the horse’s neck. Have the child choose a name for the horse. Now turn your little cowboy loose in the yard with the stick horse. It’s more fun with several children all riding their stick horses around. They can have races or play at rounding up cattle. Be sure the stick doesn’t have any splinters on it and is lightweight. Here’s a variation on the stick horse. This one has a wooden head with painted features, nailed-on ears, and straps for reins. I’m featuring today, a nature post by Gail Lee Martin’s daughter, Cynthia Ross. Gail taught all her children to observe, preserve, and love nature. She helped them identify insects, took them on geology field trips, and encouraged them to appreciate wildflowers, lichen, trees, and wildlife. Birdwatching is one of Cindy’s longtime hobbies. Here’s her post about the Eastern Phoebe. Early this spring several Eastern Phoebe built nests along the ledges of our house. They line the top of the nest with moss gathered along the creek. They’re a feisty little bird; so it’s interesting to watch them and listen to their song. The great thing about them is that they are flycatchers, which might explain why we haven’t had a lot of mosquitoes this year. When Larry was preparing to paint, he power washed the house first and accidently hit one of the nests and it fell. I rescued it from being trampled by moving it to the porch. The other 3 nests have survived and we heard the chirps of baby birds while we painted around them. We tried not to paint next to them for too long a period so the parents could still feed them. These birds are the first to migrate home after their winter travels. Further, wonderful news is that the Blue Jays are finally back in large numbers. We didn’t see one jay or chickadee all winter. Last week a water turtle was digging a hole to lay her eggs near our small garden patch. I’ll have to check back to see if they hatch. For the first time in 30 years, I finally got a bachelor button to grow and bloom. Only one tiny flower at this point but at least it is a start. Would you believe I almost pulled it thinking it was a weed last week. For some reason, this flower always reminded me of Grandma and Grandpa McGhee. Plus, I remember they had another pinkish flower vining all along the yard fence, possibly a type of sweet pea. A white-throated flycatcher (not an eastern phoebe, but similar). Photo courtesy of Pixabay. You can read more about birds and wildlife at Cynthia’s nature blog, Moss Creek. Some memories shared by Gail’s daughter, Cindy. “This photo reminds me of all the canning mom & dad did through the years. Their pickled beets were wonderful, plus the spice rings. Gail Martin and Tonda Alverez at the Butler County Museum’s Good Old Days event. 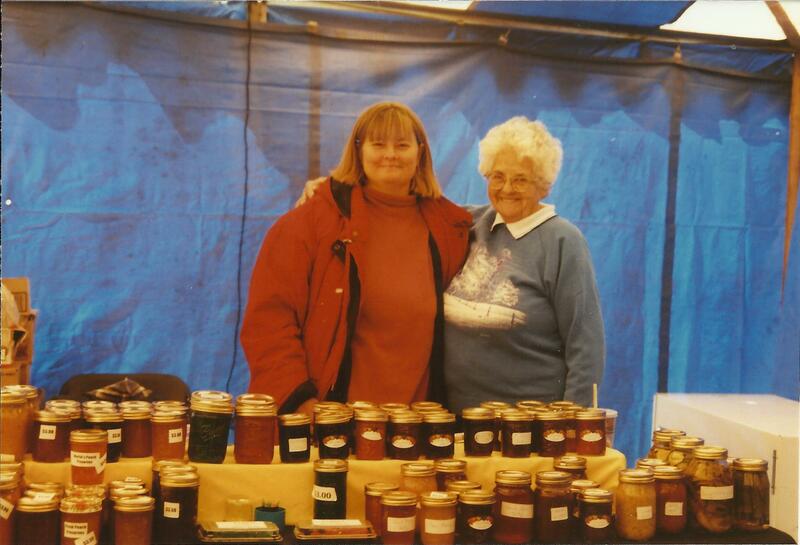 “The Butler county museum asked me to put up a canning booth at their special night of the “Good Old Days” So with Tonda Alverza from the farmer’s market we really wowed them. 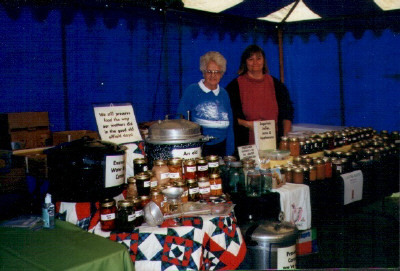 Tonda (on left) and Gail with their canning display. 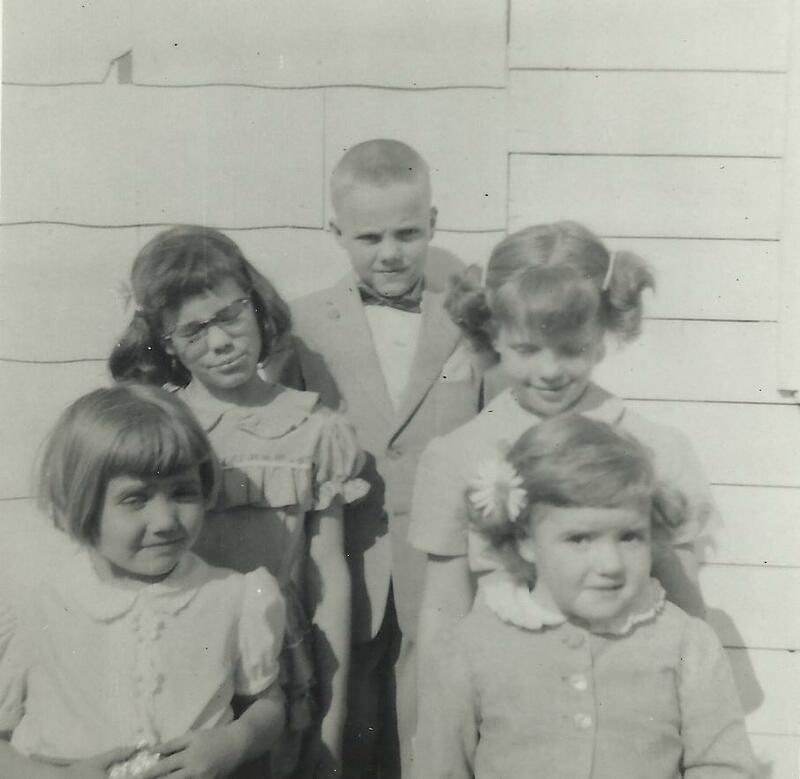 Guest Blogger is Les Paugh Sr. who married Gail’s cousin Treva Mae Davidson. He remembers that he was out of work for 6 weeks when the union went on strike, so he went to El Dorado after hearing from Roy McGhee (Treva and Gail’s uncle) that Clyde needed help on the oil drilling rig. “I went to work there November 1957. We only had two weeks of work in November and 1 week in December. We were living with Gail and Clyde Martin at that time. We had 3 kids and they had 4 or 5. The only meat we had on the table was rabbits that I shot. Clyde had a Kaiser-Frazer car with wide flat fenders. He found other work and the Paugh family found a place to live about a block from the hospital. “While I was working on the highway, east of town with the blade operator, a tornado came up on the west side of town. I told the operator that it looked like it hit our area. We both took off and went to the tool shack and our cars. I got into my 55 Packard and he went into the tool shed. The tornado turned and came over the cars and the tool shed. My Packard and his 56 Chrysler parked by mine tipped up on their sides and I thought they were going to go over, but they didn’t. The blade operator and about 6 other men came out of the tool shed and they were all as white as a sheet. I asked what had happened. They said that a long piece of 2 X 6 had gone through the shed but didn’t hit anybody there. 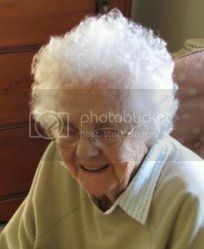 Note by Virginia Allain: At the time of the tornado, Clyde Martin was in the hospital after a serious car accident. Gail was pregnant with their sixth child, Shannon.